Human Rights Watch has published new evidence alleging the Saudi Arabian-led coalition in Yemen has been using internationally-outlawed cluster bombs. The organization says innocent civilians have been targeted in the raids. The New York-based organization visited the Saada province in the north of Yemen this month in order to compile its report. Human Rights Watch says it managed to document the use of three types of cluster munitions in the country. 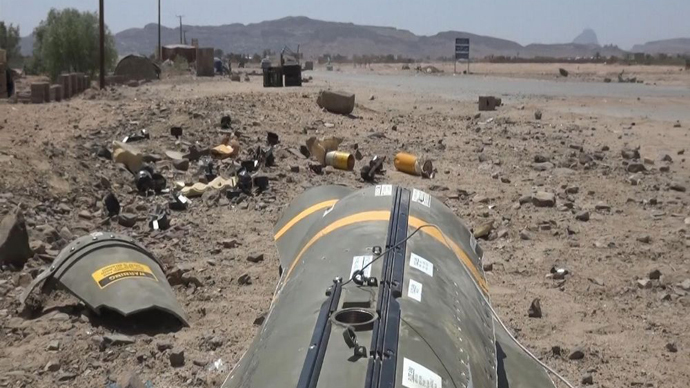 "The Saudi-led coalition and other warring parties in Yemen need to recognize that using banned cluster munitions is very likely to harm civilians," said HRW's senior emergencies researcher Ole Solvang. "These weapons can't distinguish military targets from civilians, and their unexploded submunitions threaten civilians, especially children, even long after the fighting,” he added. Human Rights Watch added at least two people injured in one air attack were likely to have been civilians. They have pinned the blame on the Saudi-led coalition because it’s the only party in the conflict using air power. In a second attack, four civilians were wounded, including a child. Both assaults took place in the northern strongholds, controlled by the Shiite Houthi anti-government forces. HRW has called on the 10-member coalition not to use cluster bombs in the conflict. It has also urged nations backing the Saudis, such as the US, to denounce the use of the illegal munitions. Saudi Arabia and the nine other Arab nations, who make up the coalition, have not signed up to the 2008 Convention on Cluster Munitions, which prohibits their use. This is not the first time Human Rights Watch has alleged the Saudi-led coalition’s use of cluster bombs during the conflict. The organization also alleges the US has been supplying the munitions used to bomb Houthi positions in Yemen. “These weapons should never be used under any circumstances. Saudi Arabia and other coalition members – and the supplier, the US – are flouting the global standard that rejects cluster munitions because of their long-term threat to civilians,” said Steve Goose, arms director at Human Rights Watch. According to the World Health Organization, the Yemen conflict, which started in March, has killed almost 2,000 people and wounded 8,000, with hundreds of women and children among the casualties. Belkis Wille, Yemen and Kuwait Researcher at Human Rights Watch, explained that HRW has just published a second report on the use of cluster munitions in the ongoing war in Yemen. “This is the second time we’ve found that coalition forces are using cluster munitions. In the reports that are published we document the use of three different types of cluster munitions all in the northern governante of Sadaa in five different incidents. And all of these cluster munition incidents have happened in areas that are near civilian centers, and therefore pose a real risk to civilians who might come across unexploded cluster munitions,” she told RT. Willie said that several weeks ago a Saudi spokesman for the coalition has denied that they have used cluster bombs. “They did not say that they would not be using cluster munitions just that they were not at that time. We have not since heard from any member of the coalition or another of the nine countries also participating in the air strikes whether they have been using cluster munitions,” she said. She said that those countries tacitly supporting the collation such as the US and the UK should do more to stop them using the weapons. Willie also voiced concerns that the coalition appeared to be targeting non-military targets. “The problem is the choice of target. We’ve seen multiple instances in which the target that was selected by the coalition is potentially a violation of the laws of war and really calls into question what process the coalition has for selecting its targets,” she said.